It's been 36 years since the release of Annie Hall, the Woody Allen film that won Oscars for Best Picture, Best Director (Allen) and Best Actress (Diane Keaton.) But still the movie attracts viewers and stirs funny memories wherever it's shown. We were reminded of Annie Hall by an article yesterday in the online edition of The Jewish Daily Forward by Lenore Skenasi. It will appear in the Friday print edition. She wrote about the film as a metaphor for feeling out of place in environments where you are not surrounded by members of your own tribe. We think of it as Jews among Gentiles, but it's probably felt by other ethnic groups living in small numbers among a majority population. It's a very interesting piece that can be read in full here. You call that a Kiddush?” whispered my husband, referring to the spread that synagogues offer after services. Except we were in a Catholic church. “Where’s the rebbetzin?” “Who’s the guy above the bimah?” “I forgot my tallis!” — yada, yada, yada (an expression, you’ll note, popularized by Jerry Seinfeld, who’s a — well, no need to beat you over the head with an all-beef salami). What is it about being in an un-Jewish place that brings out every Jewish instinct, impulse and, sometimes, wisecrack? “It’s the same way you feel very American when you’re abroad,” said Ruth Nemzoff, resident scholar at Brandeis University’s Women’s Studies Research Center, and author of the 2012 book “Don’t Roll Your Eyes: Making In-Laws Into Family.” When you’re among your own kind, you generally don’t notice the way you talk, or think, or even your core beliefs. But when you’re apart from your base, you can’t help but keep comparing what’s normal for you versus those other folks. And suddenly, everything you once took for granted (or even scorned) is very precious. Here's the famous Easter dinner scene at the home of Annie's parents. 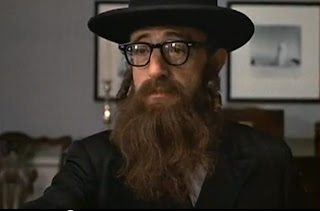 Her grandmother can't take her eyes off Alvy Singer (Woody Allen), imagining him to be a bearded Hasid. In an aside to the audience, Alvy contrasts the dinner conversation among Annie's straitlaced family about treif foods, swap meets and boat basins with the boisterous talk at his family's table.